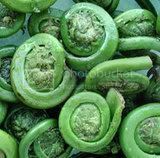 Fiddlehead Ferns: Whole Foods still has fiddleheads in their produce section, and so I finally tried some. I simply trimmed them up a bit and sauteed them in butter. I was surprised how much I liked them! They're crunchy and, well, planty tasting...but good! I know, I know...I am just not sure how to describe the taste. Just try them for yourself! The Knork: I totally made fun of this item when we got it in stock at Kitchen Conservatory, but I have to say...now that I've tried it, I tend to pick this fork up before my others! The side tines are thinner so that they cut food more easily than with a regular fork. Yet, they are not so sharp that they will cut your mouth. They are excellent for pizza, pork chops, & chicken...not so hot with steak. Local Honey: They say that eating local honey will help control allergies. I don't have allergies, but I love the honey we sell at Kitchen Conservatory. The owner keeps bees and sells the honey at the shop. It's delicious and less expensive than what you can get at the supermarket! Straw bag from Target: Ok, folks, I got a good-sized straw bag yesterday for $2.50! And it's lined! Taleggio Cheese: I chose a particularly oozy wedge of this Italian cheese to pack in the picnic yesterday. Despite the pungent rind, this cheese has a mild, buttery taste. Awesome!